Posted by SC Comments Off on What’s happened to Pakiti? The pool at Pakiti rock has all but disappeared and today I watched the appearance of a “sand island” out past Pakiti with folk playing hand-ball on it. A boat coming in had to land near the Camel. In Maori history a great sand island lay off the shore of Whatipu called Paorae, stretching from the entrance to the Manukau to the mouth of the Waikato River. Here kumara were cultivated, there were villages and extensive wetlands which were favoured for catching eel and water fowl. Before the arrival of Pakeha Paorae disappeared. In historic times, the sand reappeared to be deposited along the Whatipu Coast creating the giant sand accretion. The coastal edge moved far out to sea and dune lakes and wetlands were created. In the last five years some of this sand has broken away in hectare sized bites and these “plugs” have moved along the coast to Karekare and Piha. You can now virtually walk to the Paratahi Island at Kare Kare, which was once the focus of a surfclub “round the island” swimming race. The once bare sand dunes on the beachfront at Karekare are now well vegetated and the stream is impounded, has risen 1.5 metres in depth and is creating real problems for the surf club. 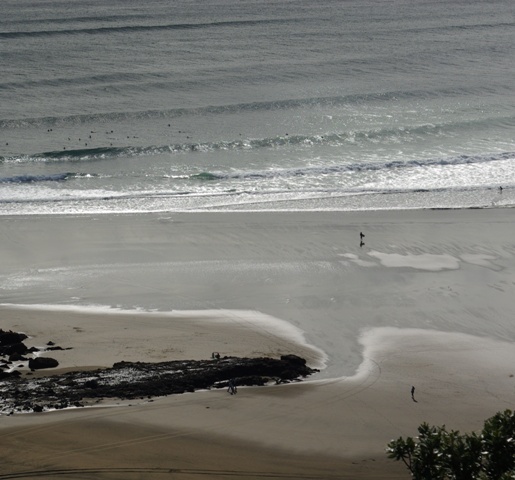 For the last few years we have seen sand build up offshore at Piha out from the Bar, with waves often breaking far out to sea. Some of this sand has recently moved onshore, filling in the lovely swimming hole that existed around Pakiti rock and allowed boat launching. The West Coast is dynamic and the changes at Pakiti demonstrate this yet again. Despite these changes, there was the most gorgeous even surf coming in today – 29 October – which was being well enjoyed by surfers.